Mega Joker Progressive Jackpot Slot Review - Casino Answers! Mega Joker is a 3-reel, 5-line progressive jackpot slot developed by Net Entertainment, featuring mystery wins, a bonus slot machine and a progressive jackpot. You can play the Mega Joker progressive jackpot slot at Bovada. Coin values on the Mega Joker slot machine are $0.10 and $0.20. You can bet 1 or 10 coins per spin. When playing 1 coin, only the first payline is selected. When playing 10 coins, all 5 paylines will be selected. The minimum bet on the Mega Joker slot game is a dime per spin. The maximum total bet is $2 per spin. Mega Joker has a low betting range and is best suited for casual players and low stakes players. You can manually skill stop the reels by pressing the “Spin” button in mid-spin. To play Mega Joker, either press the “Bet” button followed by the “Spin” button or simply press the “Max Bet” button to spin the reels. Casino Answers recommends that you play the maximum bet on Mega Joker at all times to be eligible for its random progressive jackpot. Mega Joker features a progressive jackpot. At the time of this writing, the progressive jackpot is at $7,952.62. The progressive jackpot is triggered at random, so any max bet spin you make on the Mega Joker online slot game can win the progressive jackpot. The more you bet on the Mega Joker slot machine, the better odds you have of winning the progressive jackpot. You can win the Mega Joker Progressive Jackpot by playing Mega Joker at Bovada! After any win on the Mega Joker, be careful not to hit the “Spin” button quite yet. Your winnings will be added to the Supermeter Mode. By pressing the “Spin” button, you will be spinning the Supermeter bonus slot machine above the regular reels of Mega Joker. To cash out and accept your winnings, press the “Collect” button. In the Supermeter Mode, you will be able to win greater prizes than from the regular slot game. You will be able to choose how much of your winnings you wish to bet by using the “Bet” or “Max Bet” buttons. There is a separate paytable for the Supermeter Mode as well as more symbols in the game. As it is the Mega Joker slot machine and jokers are wild, wins from the Joker symbol are wild. When you get a Joker winning combination, you will receive a mystery win in a specified range. For example, in the regular slot game, three Jokers on a payline can pay anywhere from 20 to 400 coins. In the Supermeter Mode, a Joker symbol anywhere on the reels on a 200 coin bet can win you anywhere from 100 to 2000 coins. There are 6 winning combinations on the Mega Joker regular slot game. The complete payout schedule is as follows (1/10 coin payouts in parenthesis): 3 Cherry symbols (10/20), 3 Lemon symbols (10/20), 3 Watemelon symbols (40/80), 3 Bell symbils (100/200), 3 Treasure Chest symbols (200/2000) and 3 Joker symbols (10-200/20-400). There are 9 winning combinations on the Mega Joker Supermeter Mode. The complete payout schedule is as follows (20/40/100/200 coin payouts in parenthesis): 3 Cherry symbols (100/200/200/200), 3 Orange symbols (100/200/200/200), 3 Lemon symbols (200/400/400/400), 3 Grapes symbols (200/500/500/500), 3 Watermelon symbols (500/1000/1000/1000), 3 Bell symbols (600/1200/1200/1200), 3 Seven symbols (800/2000/2000/2000), 3 Joker symbols (1000/2000/2000/2000), 1 Joker symbol on the center reel (-/-/100-2000/-) and 1 Joker symbol anywhere on the reels (-/-/-/100-2000). The Mega Joker slot machine is definitely something different. It’s got a few things about it that aren’t really like anything else around. It takes a little bit to get used to, but we really appreciate originality in slot machines, which is why the Mega Joker progressive jackpot slot scores points with us. We recommend you give this slot game a chance on that basis. You can play the Mega Joker slot machine when you sign up and make a deposit at Bovada! How come I’m not being paid for my winnings on the Mega Joker online slot? If you are not receiving your winnings on the Mega Joker slot game, you are probably playing the Supermeter Mode. Hit the “Collect” button after a win if you do not wish to risk your winnings to win greater winnings from the Mega Joker Supermeter Mode. The paytable says “10-200” and “20-400” under the Joker symbol. What does that mean? The Joker symbol pays mystery wins. The payouts listed are the range your mystery wins for that winning combination will be in. Why are there two slot machines? 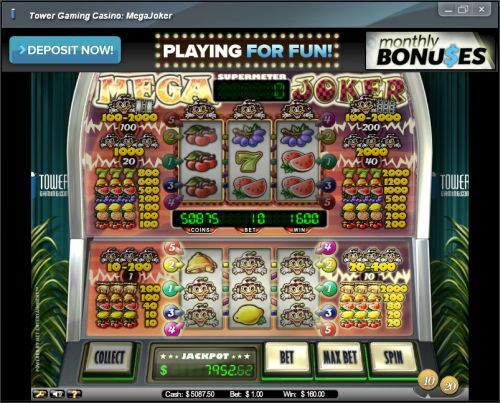 Mega Joker has two slot games – the regular mode and the Supermeter Mode. The one on the bottom is the main game and the one on top only plays after you have won cash to risk on it. Can players from the USA play the Mega Joker slot machine for real money? No, American players cannot play the Mega Joker slot machine for real money. If you want a great selection of USA-friendly online slots to play, please visit Bovada. Where can I play a free flash game of Mega Joker in my browser? You can play Mega Joker for free or real money in your browser at Bovada. If you experience any issues with the flash casino, you can download the newest version of Adobe Flash Player. Progressive Slots, how to play the Mega Joker slot?